The towering cupola of the Church of the Annunciation in Nazareth stands over the cave that tradition holds to be the home of the Virgin Mary. The outcome of Mary’s consent is carved in Latin across the façade over the triple-doorway entrance: “The Word was made flesh, and dwelt among us” (John 1:14). 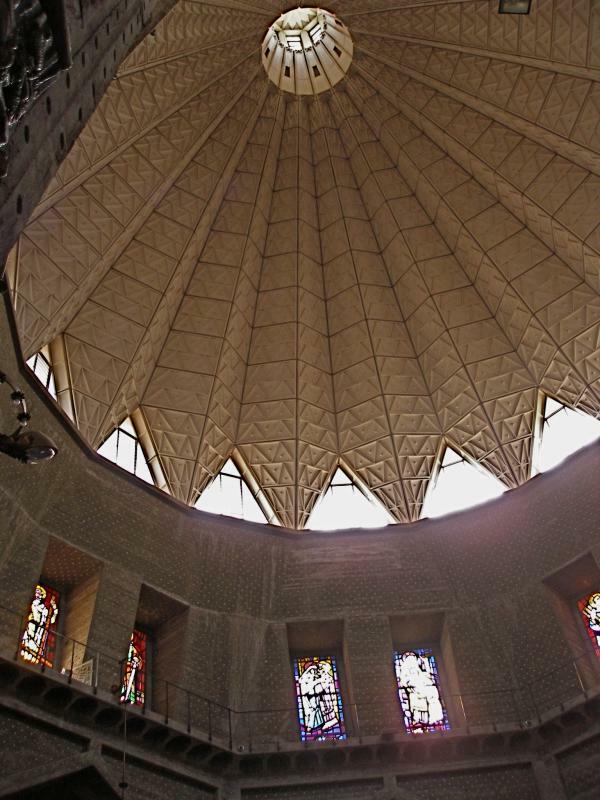 The massive two-storey basilica, in strikingly modern architectural style and colourfully decorated, became the largest Christian church in the Middle East when it was completed in 1969. It contains two churches, the upper one being the parish church for Nazareth’s Catholic community. The cupola, which dominates modern-day Nazareth, is surmounted by a lantern symbolising the Light of the World. Entry is from the west, where signs indicate a route for visitors. On the cream limestone façade are reliefs of Mary, Gabriel and the four evangelists, Matthew, Mark, Luke and John. Above them is a bronze statue of Jesus. Over a door on the southern side stands a statue of Mary aged 14, welcoming all who come to visit her home. The lower level of the Church of the Annunciation enshrines a sunken grotto that contains the traditional cave-home of the Virgin Mary. The cave is flanked by remnants of earlier churches on the site. Its entrance is sometimes closed by a protective grille. Inside the cave stands an altar with the Latin inscription “Here the Word was made flesh”. To the left of the cave entrance is a mosaic floor inscribed with the words “Gift of Conon, deacon of Jerusalem”. The deacon may have been responsible for converting the house of Mary into the first church on the site, around 427. 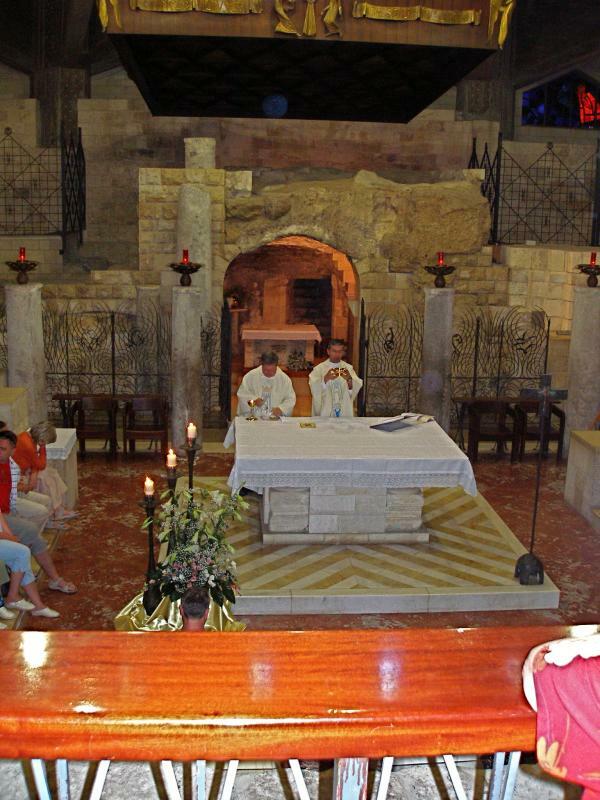 In front of the cave is another simple altar, with tiers of seats around it on three sides. Above it, a large octagonal opening is situated exactly under the cupola of the church. The plan of two churches, one above the other and interconnected, was conceived by the Italian architect Giovanni Muzio. As well as preserving the remains of previous churches on the lower level, he allowed for the risk of earthquake by constructing the building in three separate sections of reinforced concrete. The soaring cupola represents an inverted lily opening its petals to the shrine below. The symbolism combines the lily, as an image of Mary’s purity, with one of the Semitic meanings of the name Nazareth, a flower. A spiral stairway at the main entrance leads to the large and spacious upper church. This is the parish church for the Catholic community of Nazareth (which is why the inscriptions on the ceramic Stations of the Cross are in Arabic). The main entrance of the upper church is on the northern side, leading off a large elevated square overlooking the valley of Nazareth. Around the walls of the upper church are colourful representations of the Virgin Mary in a variety of materials, presented by many countries. Behind the main altar is a huge mosaic, one of the biggest in the world, depicting the “one, holy, catholic and apostolic church”. The first church on the site venerated as Mary’s home was built around 427. The Crusaders built a huge basilica on its ruins, but this too was destroyed when the Crusader kingdom fell in 1187. In 1620 the Franciscans managed to purchase the site from the local Arab ruler, but it was a further 120 years before they were allowed to build a new church. When that church was demolished to prepare for the modern basilica, extensive excavations took place. These revealed the remains of the ancient village of Nazareth with its silos, cisterns and other cave-dwellings. The most sensational discovery was of a shrine or synagogue-church dating back to before the first church was built. Scratched on the base of a column appeared the Greek characters XE MAPIA, translated as “Hail Mary” — the archangel Gabriel’s greeting to Mary. 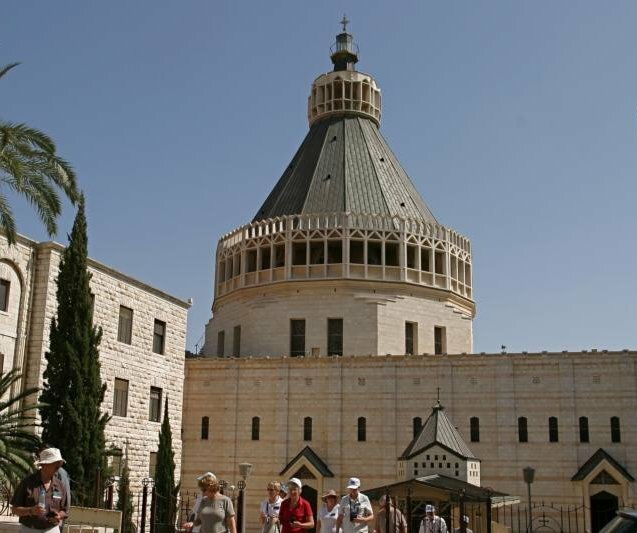 In December 2009 the Israel Antiquities Authority announced the discovery of a house from the time of Christ, on a property next to the Church of the Annunciation. The authority described it as “the very first” residential building found from the old Jewish village. Small and modest, the house consisted of two rooms and a courtyard with a cistern to collect rainwater. 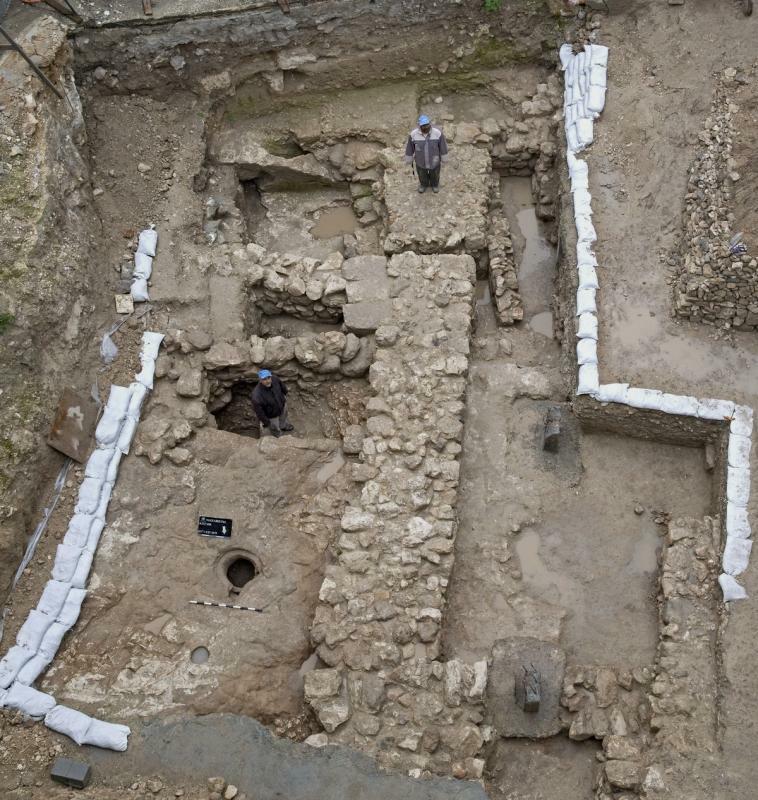 The remains of the house were found during an excavation prior to construction of the Mary of Nazareth International Center. They are conserved and displayed inside that building.